Pro Bono Consulting for Civic Bridge | Organizational Strategy | May - Aug 2017 | Research. Strategy. Design. 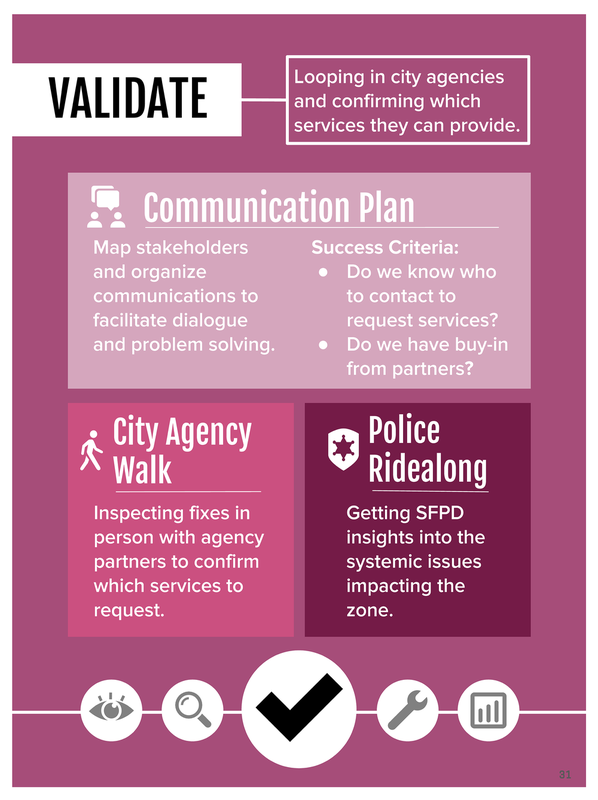 Over summer 2017, my team participated in Civic Bridge program and we worked with Fix-It Director Sandra Zuniga to develop a playbook for neighborhood engagement to help them scale their operations. The four of us who developed this playbook are students in the MBA in Design Strategy (DMBA) program at California College of the Arts. This project opportunity was presented to us by the Mayor’s Office of Civic Innovation (MOCI) via the Civic Bridge program, which brings private sector professionals together with government employees to address critical challenges facing the city. 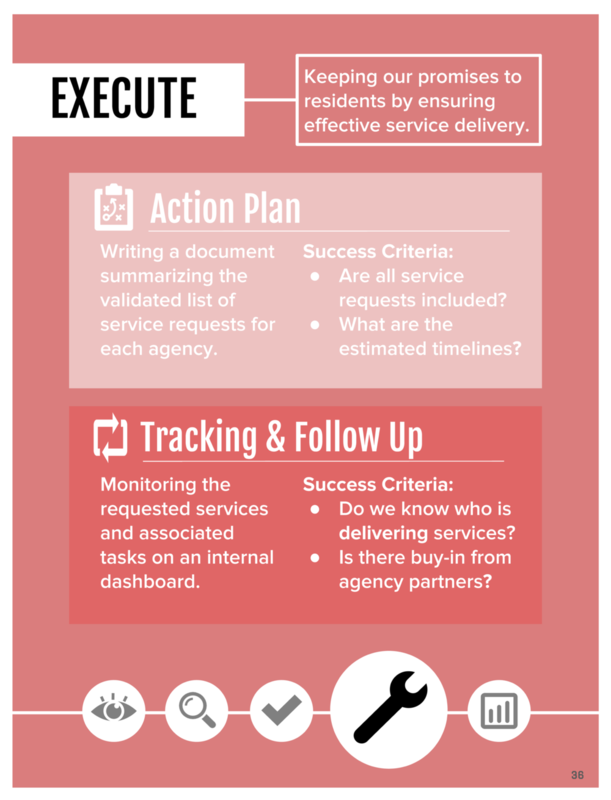 Fix-It’s resident-centric service delivery process was immediately engaging for all of us. In May 2016, Mayor Lee announced the Safe and Clean Neighborhoods Promise, a new initiative to improve quality of life in San Francisco. Mayor Lee’s executive directive affirms: "All residents are entitled to feel safe in their homes and neighborhoods. All residents are entitled to clean, well-maintained public spaces and facilities, such as parks, libraries, public transportation, sidewalks, and streets." To deliver on this promise, the Mayor established the neighborhood-based Fix-It Teams under the new role of the Fix-It Director, Sandra Zuniga. 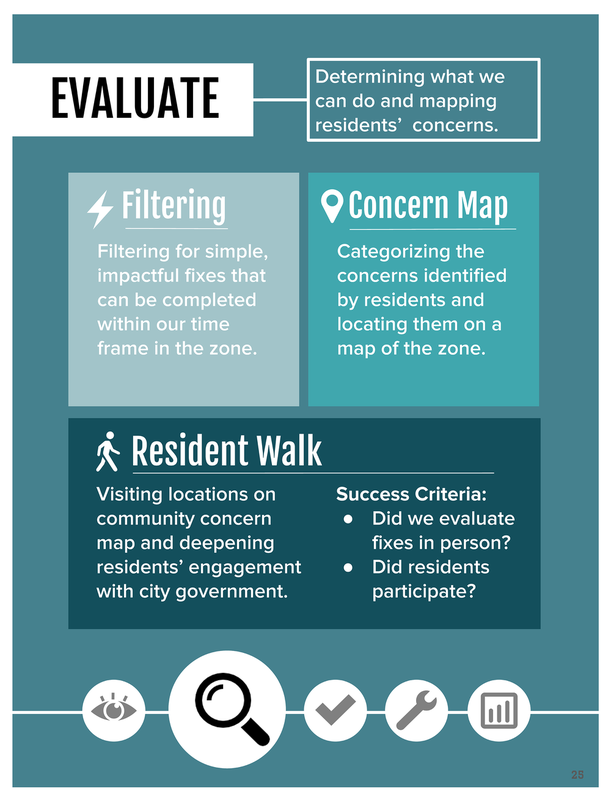 Fix-It is focused on resolving immediate neighborhood concerns. After initial work in 5 pilot zones, Fix-It prepares to expand to 20 zones in 2017. Fix-It isn’t just beautifying our communities. It’s strengthening them, connecting residents to city services, and introducing neighbors to each other to empower lasting change. • Create a replicable operational process for staff to follow. • Identify how Fix-It engages community/residents in its work. • Propose measures of success for Fix-It. We quickly learned that Sandra already had a resident-centric service process in place. As we interviewed her and spent time with her in the field, we began to understand her workflow. From this foundation we were able to organize her process into categories and distill best practices around community and agency engagement. Along the way we also spoke to a variety of community members and partnering agencies to understand how they experienced Sandra’s work and where Fix-It’s value lies. On top of stakeholder interviews, we also went to the field during community meetings and walks to observe how Fix-It engages with neighborhoods. Each section starts with a cover page highlighting objectives and key activities for first-time users and easy reference. We start each section by providing an overview of each phase. Objectives are clearly identified to inform how the team might work towards them. Following the section cover page, we provide details of what each identified key activity entails. Below is an example of what Community Meeting, one of the key activities in Identify Phase, entails. 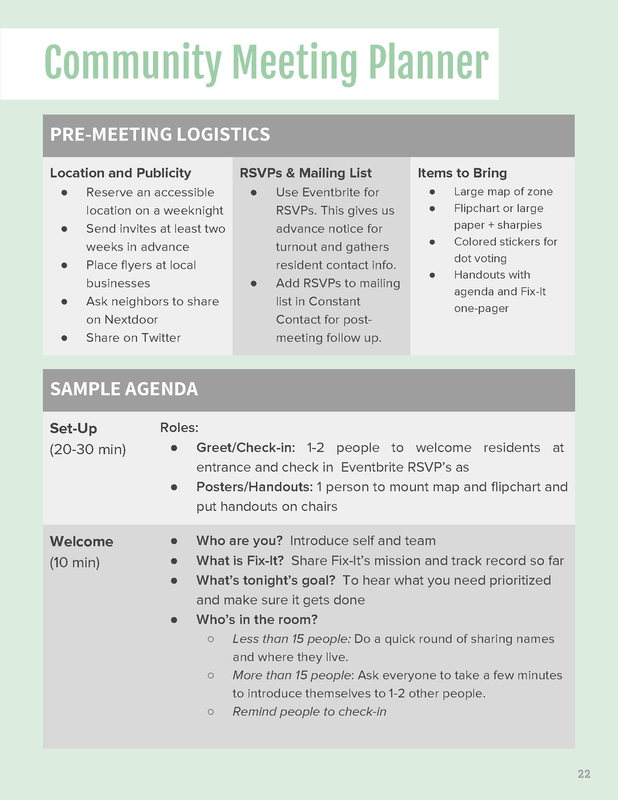 We provide a broad overview of what a community meeting should look and feel like.